With our rich industry experience in this domain, we are introducing a comprehensive assortment of Automatic L Sealer Tunnel. The machine adopts imported and the most advanced PLC programmable controller, safety protection and high-speed stability. A variety of settings can be operated on the touch screen easily. This machine adopt side sealing design. 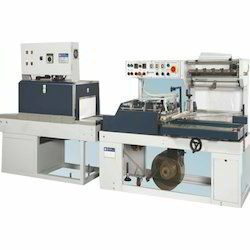 The sealing line height can be adjusted according to the height of packing products. Auto Waste Film Winding Device. Vertical / Horizontal Photo Cell. Looking for Automatic L Sealer Tunnel ?